These quotations show a deep sense of humor and hide, but not too much, a sad resignation. 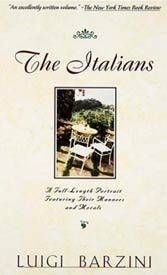 They were written more than thirty years ago by Luigi Barzini Jr., one of the greatest Italian journalists and writers of the twentieth century. His father, Luigi Sr., was a famous journalist too, an editor of the Corriere della Sera, and an adventurer. His book, Peking to Paris, documented a 1907 legendary motor race over that route, run while he was accompanying Prince Scipione Borghese. Following his father’s path, Luigi Jr. had a really adventrous life. He worked as a journalist throughout his existence, even though he can also be considered a writer and acute thinker. Born in 1908, he studied in Italy and at Columbia University, also working for two New York newspapers. After graduating he came back to Italy in 1930 and became a correspondent for the Corriere della Sera. He returned to the U.S. to follow the events before World War II, writing keen coverage of the New Deal, the 1936 elections and America’s mood on the eve of a terrible war. Shortly after Barzini’s return to Europe, Hitler invaded Poland and he was sent as a correspondent to London. In 1940 he was jailed in Rome as an opponent of Mussolini’s regime, after which the Fascists confined him to forced residence in a village. After the Allied liberation he returned to publishing, becoming the chief editor of several newspapers and magazines, and a writer. His most famous books are Americans Are Alone in the World (1953), The Italians: A Full Length Portrait (1964), From Caesar to the Mafia (1971), O America When You and I were Young (1977), The Europeans (1984). He died in 1984. Barzini’s most famous book, The Italians (1964), is a rich cultural portrait of his people made using a unique style and a language entertaining to his readers. Barzini elegantly creates unforgettable drawings representing vices and virtues of the Bel Paese’s inhabitants and his acute analyses are so topical, with a “prophetic” characteristic typical of great intellectuals. He presents to his readers two Italies: one of them was the homeland of geniuses such as Leonardo da Vinci, Dante Alighieri, St. Thomas of Aquino. This outstanding Italy is opposed to another one that is weak, unable to react, backward in political action, “invaded, ravaged, sacked, and humiliated in every century.” According to Barzini, “Italians have always excelled in all activities in which the appearance is predominant: architecture, decoration, landscape gardening, the figurative arts, pageantry, fireworks, ceremonies, opera, and now industrial design, stage jewelry, fashions, and the cinema. The paradox is that a country that gave an important contribution to the idea of modernity, the land where politics became a discipline, thanks to the writings of Machiavelli, keeps producing throughout the century politics that are more picturesque than practical, politics that care for appearances more than for serious and responsible action”. Thoughts that also describe contemporary Italy to a tee! In his writing he supports the theory by which Italy is more a geographical concept than a real nation and that its inhabitants live on “public lies” and “private truths”. He points out that his peers have lost their faith in any kind of government and that they may never achieve enough self-confidence to exert real control over international economic or political affairs. Barzini thinks that the only fundamental institution in the country is the family, within which Italians practice “virtues other men usually dedicate to the welfare of their country at large; the Italians’ family loyalty is their true patriotism.” However, Barzini explains, the strength of the family is not only a defense against disorder, “but one of its principal causes.” Barzini’s words show his deep turmoil of feelings, a mixture of disillusion, love, hate, sarcasm, sense of humor, words that could have been written just yesterday. His capacity to “read” the worlds that surround him permeates all his writings. For example in 1977, after having spent years in the U.S. both as a student and a worker, he wrote the essay O America: in it he pointed out how hard it is to present to the Americans a modern image of Italy. “I translated aloud writings by Leopardi and Dante, - Barzini wrote in O America- also to show that Italy is not only tomato sauce and cloves of garlic.” He was clearly referring to the immigrants arriving in America in miserable conditions at the end of 1800s and at the beginning of 1900s: in some way they must be considered the ancestors of those who nowadays take long boat journeys to emigrate in foreign countries. Among them, we can also include those who have fed the waves of immigration in Italy in recent years. In this case too, Barzini’s gift for anticipating events is more than evident: he recognizes the necessity for integration and cooperation, leaving no room for stereotypes. Going back to 1954, we find further evidence of the impressive gift that makes of him an acute observer. The reader approaching his writings admires him wholeheartedly but also wonders, what would his opinion be on today’s politics, the contemporary world, the U.S after 9/11, the recent economic crisis? What would Barzini have written on these matters? The Italians: Yesterday and Today. Luigi Barzini Jr.